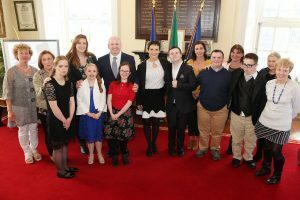 A GROUP of graduates who have just completing a two-year course on politics and voting with the European Down Syndrone Association were thrilled to have their certificates presented by presidential candidate Seán Gallagher. The eight students from around Kildare were presented with their certificates in the Town Hall in Naas after completing My Opion My Vote (MOTE). The European initiative looks at referenda, local and national parties, voting and the importance of having their say. Businessman Seán Gallagher was in town for a meet and greet with locals. He took time to call in to local shops and meet with people on the street as part of his national campaign trail. He said he was particularly delighted to present the awards as his wife Trish, who accompanied him, has a brother with Down Syndrome. “I spoke to them about the importance of voting and about how we should all make sure to vote,” said Mr Gallagher. He said he also took the opportunity to outline a year long disbaility focused programme that he has planned if he gets elected. He was joined by Deputy Mayor Carmel Kelly who had previously taken the students to sit in on a Naas Municipal District meeting. “Attending the meeting added an extra dimension to the voting process,” said Cllr Kelly. Mr Gallagher spent time calling in to local businesses to chat about trade and concerns. “I got to meet with lots of locals and it was all very positive,” said he said.